CPR Training Professionals provides accredited CPR and First Aid Training in Orange County, Los Angeles, San Diego and Riverside County. We provide onsite training to all OSHA compliant workplaces. Is your business or workplace prepared for an emergency? We use the most current CPR, AED and First Aid training which incorporates the current standards of care that meet OSHA Guidelines for First Aid and the Emergency Cardiovascular Care Guidelines (ECC) for CPR. Need CPR and First Aid Training for your staff? We offer customized CPR and First Aid training courses that meet your group, organization or business needs. Our goal is to give you the skills and confidence you’ll need to make decisions and take action in an emergency situation. Description: CPR and First Aid Training course meets OSHA requirements and teaches employees how to respond to cardiac and breathing emergencies in adults and common first aid emergencies in the workplace, including burns; cuts; head, neck and back injuries and more. Description: This course meets OSHA requirements and teaches advanced level CPR and AED training for individuals who have a job-related “duty to respond” to emergencies. Learn how to recognize and provide care in respiratory and cardiac emergencies for adults, children and infants, with special emphasis on two-rescuer CPR, use of the resuscitation mask, bag-valve mask and Automated External Defibrillator. Audience: Emergency responders, housekeeping and janitorial staff, health care providers, law enforcement, and anyone with potential for exposure to blood or body fluids. Description: This optional add-on course meets OSHA’s revised Bloodborne Pathogens Standard. This course teaches participants how bloodborne pathogens are spread, how to prevent exposures and what to do if exposed to infectious materials. Employers are required by OSHA standard 29 CFR 1910.151 to have a person or persons adequately trained to render first aid for worksites that are not in near proximity to an infirmary, clinic, or hospital. It is advised that the first-aid program for a particular workplace be designed to reflect the known and anticipated risks of the specific work environment. Consultation with local emergency medical experts and providers of first-aid training is encouraged when developing a first-aid program. 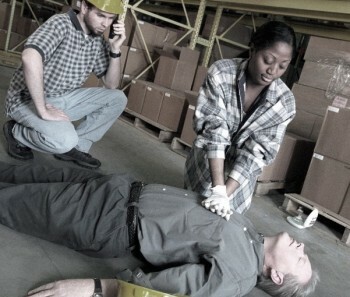 OSHA requires certain employers to have CPR-trained rescuers on site. Sudden cardiac arrest is a potential risk at all worksites, regardless of the type of work. Serious consideration should be given to establishing a workplace AED program. First-aid supplies must be available in adequate quantities and be readily accessible. First-aid training courses should include instruction in general and workplace hazard-specific knowledge and skills. CPR and First Aid training should incorporate AED training if an AED is available at the worksite. CPR and First Aid training should be repeated periodically to maintain and update knowledge and skills. Management commitment and worker involvement is vital in developing, implementing and assessing a workplace first-aid program.